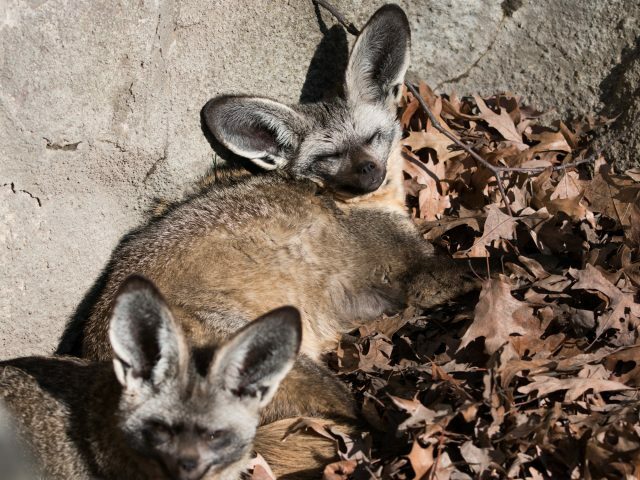 Bat-eared foxes are sandy gray with light fur on the belly and dark fur around the eyes, back of the ears, muzzle, feet and tail tip. This fox is known for its enormous ears which can grow to over 5 inches long. As you can imagine, these animals have a great sense of hearing. 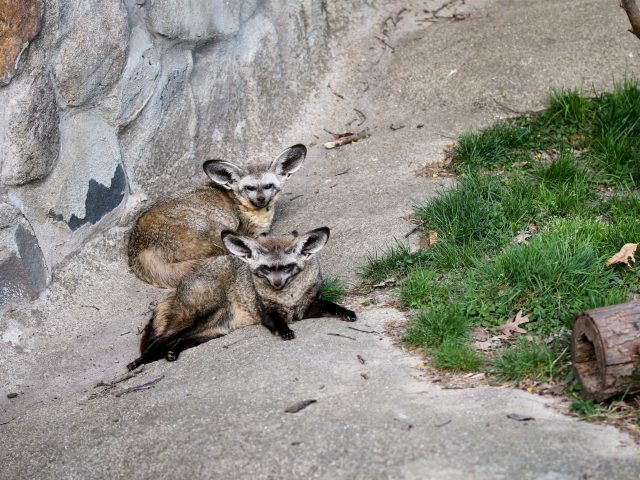 Bat-eared foxes live in pairs or small groups. They spend most of the day sleeping and come together at dusk for playtime and social grooming before foraging throughout the night. 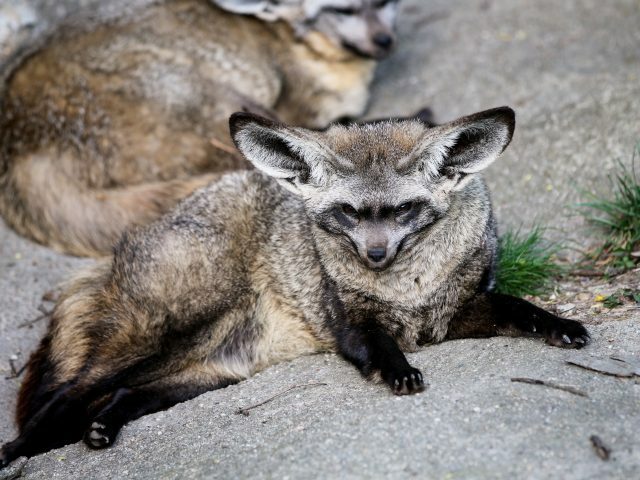 Unlike other canids (members of the dog family), the male bat-eared fox takes on the majority of the parenting once the mother gives birth. 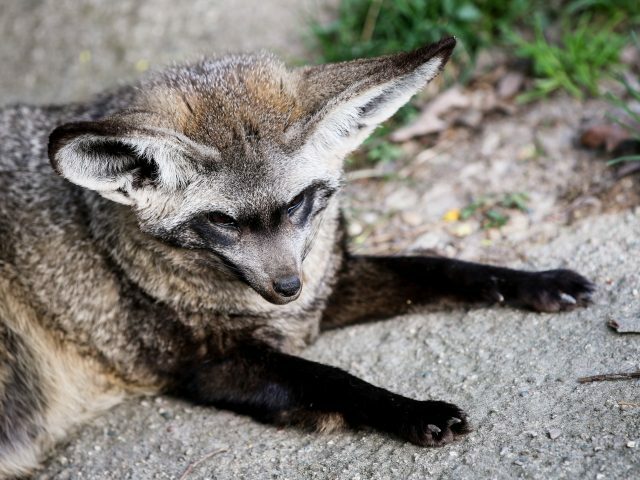 Bat-eared fox live in dry, short-grass savannas and brush in southern and eastern Africa. 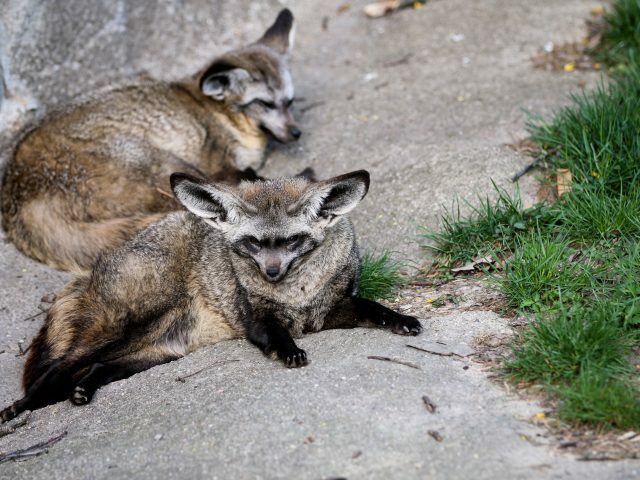 The bat-eared fox diet consists mainly of insects such as ants and termites, in the rainy season and mice in the dry season. Here at the zoo, we feed them a dry carnivore pellet, specially formulated carnivore meat, crickets, mealworms, fruits and vegetables. A typical adult bat-eared fox is 12 to 16 inches tall at the shoulders and its head and body measure between 18 and 26 inches in length. Its tail ranges from 12 o 14 inches long. This mammal weighs 6 to 12 pounds. Although bat-eared fox enjoy eating millipedes, fruit and egg, the majority of their diet is made up of insects (especially termites).